Hey, we’ve all been there… Watch my FB live below to see how! Sometimes prospecting can make you feel like you’re spinning your wheels, getting nowhere fast. Most of what’s being taught simply doesn’t work! Repelling people rather than attracting them to your business! Every day, somewhere between 15 and 20 people reach out to us to ask exactly what it is that we’re doing. They are, quite literally, inviting themselves to take a look at our business. Our method starts with creating curiosity. It relies on making yourself so unique people want to reach out to YOU and invite themselves to take a look at whatever it is you’re doing. So you don’t have to worry about finding and inviting people, because you’ll have a constant, never-ending stream of people reaching out to you. Now, you’re probably wondering how this works, what platform you use, and if it’s free or paid. We use some paid Facebook advertising, and we also use a lot of organic, non-paid stuff as well. You can use this method on your personal profile, your business or fan page, and in groups. 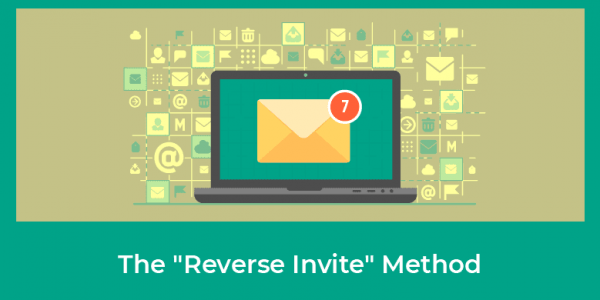 The Reverse Invite principles are always the same! It all starts with a post to create curiosity. If you’re tight on funds, you can start using organic, free exposure in the News Feed. But when you pay to boost one of these posts, you’re paying to get in front of a global audience, and that’s when you can start to scale and create leverage. So how do you create a post that generates enough curiosity for people to reach out to you? For us, we do a lot of Facebook Lives—it’s our “go to” strategy. But you don’t have to do Facebook Lives or any kind of video marketing if you don’t want to. The answer to that question will be different for everybody. It might be one, two, even three things that people need to know. What’s holding them back or keeping them stuck? What critical information are they missing to solve their issue? What revelation or realization do they need to move forward? Dig deep into whatever PAIN or PROBLEM they’re going through right now. Maybe you ask them to comment “more info” on your post. Maybe you ask them to follow a link so they can get more detailed information. Or maybe you instruct them to message you via Messenger for more information. That’s how you “reverse” the invite. And they will invite themselves. Should you share your product on your Facebook Lives? And the answer is: absolutely, positively, NO! That’s the biggest mistake any new networker or affiliate marketer can make. New marketers think it’s the product that gets people excited. The truth is, people don’t care about your products! They don’t have enough information to care about your products. You have to make them aware they need your products first. It’s NOT your product or service that makes you unique! It all comes down to finding out what makes YOU, or whatever at you’re selling, unique. How does your product or service help someone reduce or eliminate whatever pain they’re experiencing right now? As an example, let’s talk about weight loss. People are NOT interested in learning how to lose weight. They already KNOW how to lose weight. What IS interesting to them is how your product is DIFFERENT from anything else they’ve seen. What IS interesting is your unique position about your products. Once you persuade someone to walk through your process until they say, “Yes, I need to talk to you about something,” then you can have the conversation about why they need what you have. You’ll talk about the problems they’re having, you’ll show you understand and can relate to those problems, and then you’ll tell them there’s a solution—WITHOUT giving it away. You’ll ask them to DO SOMETHING to get the information they want. In other words, you’ll set it up so that they have to take action and reach out to you to get the info they want. You create curiosity so they want to learn more. And the best way to create curiosity is by telling a story. People in network marketing hear that all the time, yet few people understand how this really works. Compelling stories make people WANT to get onboard with whatever you’re doing. Some network marketers can’t stop themselves from talking on and on and on about how amazing their lives are and how much their lives have changed since they joined their company—and it ANNOYS the heck out of their friends, family, and anybody else who’s subject to it. So how do you keep from annoying people? How can you attract people instead of repelling them? Your company, whatever system you’re using, did not get you where you are. So instead of focusing on your product, service or company, you should focus on yourself as a unique individual with a unique story. Focus on making YOU that unique selling point so that people reach out to you. It doesn’t matter what company you’re with. It doesn’t matter what product you promote. The bond YOU create with people is going to take you much further with them than your product ever will. I remember answering with a lie. Thank God we learned to flip that story on its head. And when we started telling the truth about where we were and how we were, our presence started to shift. Then people could authentically connect with us. They felt the truth of our story. People found what we were experiencing valuable. Ultimately, the “big secret” is to come from a place of SERVICE. When we told people our life was “amazing,” they knew we were BS’ing. They saw right through it. They saw right through us. The more authentic you are, the more you focus on bringing service and providing value, you become that servant-leader, and that’s when people come and want to join you. All we did was share the truth about our story. We just told the truth. And if you’re new to this whole idea, then I strongly encourage you to sign up for our FREE 10-Day Online Recruiting Bootcamp to learn more about how to build your network marketing businesses online, so you don’t have to be that annoying friend who can’t stop talking about their products. We used to be “mall sharks”—and even tried to hunt down prospects on the Vegas strip. Thank goodness those days are over for us! They can be over for you, too. The bootcamp contains the exact same information we used to get started on our journey of learning how to market ourselves online.